Corruption and the risk of political destabilisation rank alongside the Russia-Ukraine conflict and information warfare as the principal security challenges facing Moldova. 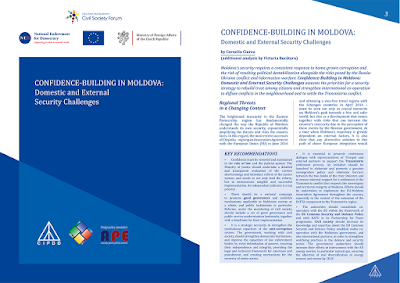 Confidence-Building in Moldova: Domestic and External Security Challenges assesses the priorities for a security strategy to rebuild trust at home and strengthen international co-operation to diffuse conflicts in the neighbourhood and to settle the Transnistria conflict. The study by by Corneliu Ciurea (with additional analysis by Victoria Bucătaru) is the latest paper to complement the overview study, Security Alert on the EU's Doorstep: Strategies for Strengthening Security in the Eastern Partnership Countries, published by the Caucasus Institute for Peace, Democracy and Development/CIPDD (Georgia) and presented at a roundtable event hosted by the Polish Institute of International Affairs (PISM) in Warsaw on 21 June 2016. • Confidence must be restored and maintained in the rule of law and the judicial system. The Ministry of Justice should undertake a detailed and transparent evaluation of the current shortcomings and introduce reform of the justice system, and needs to not only lead the reform, but to demonstrate tangible and successful implementation. An independent judiciary is a top priority. • There should be a national campaign to promote good governance and establish mechanisms applicable to Moldovan society as a whole, and public institutions in particular. Reforms, under the monitoring of civil society, should include a set of good governance and public service modernisation landmarks, together with a timeframe for their implementation. • It is a strategic necessity to strengthen the institutional capacities of the anti-corruption system. The government, working with civil society, should strengthen democratic institutions, and improve the capacities of law enforcement bodies by strict delimitation of powers, ensuring their independence and integrity, providing the legal and technical framework for sanctions and punishment, and creating mechanisms for the recovery of stolen assets. • It is essential to promote continuous dialogue with representatives of Tiraspol and external partners to support the Transnistria settlement process. An initiative should be launched to elaborate and promote a genuine reintegration policy and eliminate barriers between the two banks of the river Dniester, and to ensure external support for a settlement of the Transnistria conflict that respects the sovereignty and territorial integrity of Moldova. Efforts should be undertaken to implement the EU-Moldova Association Agreement throughout the country, especially in the context of the extension of the DCFTA component to the Transnistria region. • The authorities should consolidate co-operation with the EU within the framework of the EU Common Security and Defence Policy and with NATO in its Partnership for Peace programme. Civil society should increase its knowledge and expertise about the EU Common Security and Defence Policy, establish viable co-operation with the Moldovan government, and also international partners, in order to strengthen watchdog practices in the defence and security sector. The government authorities should increase their efforts to interconnect with the EU energy market, in particular natural gas, ensuring the objective of real diversification of energy sources and routes by 2018. Corneliu Ciurea is an independent security expert, and Victoria Bucătaru is Programme Director of the Foreign Policy Association, Moldova. The editor of the study was New Diplomacy Chair, Jeff Lovitt. The paper was produced in the framework of the project Security Alert on the EU’s Eastern Doorstep by the Caucasus Institute for Peace, Democracy and Development/CIPDD (Georgia), in partnership with the Foreign Policy Association (Moldova) and the NGO Promotion of Intercultural Cooperation (Ukraine).